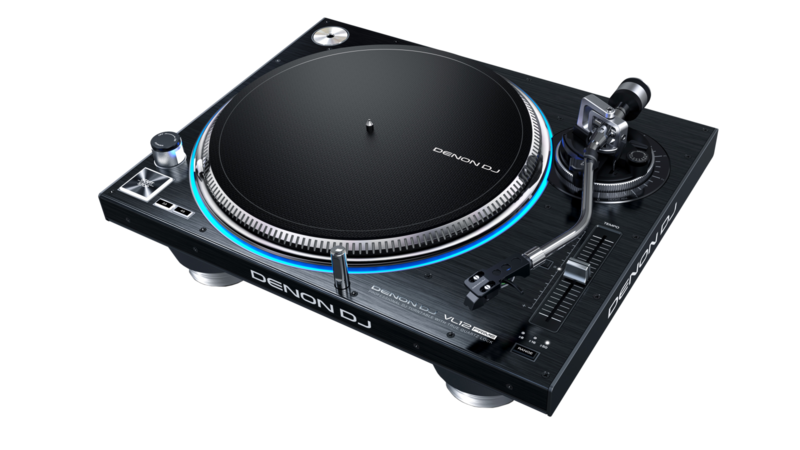 The Denon DJ VL12 Prime sets the new bar position as the most superior turntablist technology available today. The premiere direct-drive turntable features a true quartz locked system that offers the most optimal acoustic isolation capabilities, even in the loudest, bass-heavy environments. This article answers some of the popular questions about the features and functionality of the VL12 Prime. What is included with the VL12? Is the VL12 direct-drive or belt-driven? What does "True Quartz Lock" mean? What type of cartridge is compatible with the VL12? Is the torque setting adjustable? Is the output phono or line level? Can I change the color of the platter LED? What is the purpose of the Strobe Light? What do I use the Target Light for? How do I know where to set the counterweight? The VL12 features a highly responsive direct-drive motor, quartz-locked and isolated for optimal signal-to-noise ratio. True Quartz Lock describes the incredible stability and precision of the VL12 motor. Quartz controlled systems are known for their incredible timing accuracy and reliability compared to their servo driven counterparts. This means that your platter will always remain steady and consistent. Any standard cartridge will be compatible with the VL12 Prime. Yes, the torque setting can be adjusted between Hi and Lo settings. The VL12 features the highest torque in the industry with 5kgf/cm on the Hi setting, for a heavy, strong feel. Or choose the Lo setting at 3.4 kgf/cm for a lighter more graceful feel. The output is phono and should be connected to phono inputs on your mixer or receiver. Yes, the LED color can be changed along the RGB spectrum to match the mood and style of your set. The brightness of the LED can also be adjusted or turned off entirely. The Strobe Light shines on the edge of the platter to help you determine if the phase is constant. If the vertical lines appear static and still while the platter is spinning, the rotation is consistent. If the lines appear to be drifting, then the rotation is out of phase. The Target Light is included to help you see the grooves on the record in dark environments so you can accurately place the stylus. Simply connect and disconnect the light to its port to turn it on/off. The counterweight is set according to the designated pressure/weight requirements for your cartridge/stylus. Check the documentation for your cartridge to determine the proper counterweight setting.